Home Tags Posts tagged with "Parkshuttle"
Earlier today 2getthere hosted ‘insights in driverless transit’ at business park Rivium in the City of Capelle aan den IJssel, providing information about the key aspects related to the realization of automated vehicle systems. The ParkShuttle system at Rivium remains the only automated vehicle system operational at grade, featuring at grade intersections with other traffic, which doesn’t require a safety driver or steward on each vehicle to warrant the safety. The program ‘insight in driverless transit’ was hosted for consultants specifically, drawing visitors from Italy, South-Africa, Sweden, Norway, Singapore, USA and the Netherlands. Presentations during the morning program were made by the Metropolitan Region Rotterdam The Hague, Ricardo Rail, SMRT and 2getthere. In the afternoon the ParkShuttle served as the reference visit preceding the Podcar Conference. Following earlier conferences in amongst others Silicon Vally, the conference is organized on 20 and 21 September in Antwerp, Belgium. In addition to 2getthere, the city of Capelle aan den IJssel and Connexxion shared their experiences with the operations of the ParkShuttle system over the last 10 years with the visitors. Subject of presentations and discussion during the conference will be Mobility as a Service, experiences with operational systems, policy making, sustainability, safety, multimodility and ‘City of Things’. Speakers represent local authorities, real estate and system developers, public transit operators, consulants and universities. In 2017 the city of Capelle aan den IJssel and 2getthere partnered to submit a proposal to ‘de Verkeersonderneming’ and were granted a 50% contribution for renewal and extension of the system. Starting September 2019, six new 3rd generation vehicles will be introduced to replace the 15 year old vehicles that have been operating the route for 12 years day-in-day-out. Connexxion will continue to operate the system on the existing route, serving the existing stations. By late 2020 an extension of the route, in mixed traffic, is foreseen towards the waterfront where a stop for the Waterbus will be created. The ParkShuttle becomes the unique link between the Rotterdam metro network and the Waterbus. 2getthere works together closely with RDW, the Dutch road authority, to be approved as the first autonomous system to be certified for operations in mixed traffic without safety steward on-board. The extension increases ridership by an expected 20% to approximately 3,000 per day. The introduction of the 3rd generation ParkShuttle was the spark that ignited the redevelopment of the Rivium business park. Where previously it was the business park in the Netherlands with the highest rate of available space, it is now (nearly) ‘sold out’. Offices are being transformed into housing and new residential buildings are introduced, resulting in 7,000 to 9,000 residents at Rivium. To accommodate livability and accessibility, the public transit capaacity needs to be upgraded to accommodate the redevelopment. 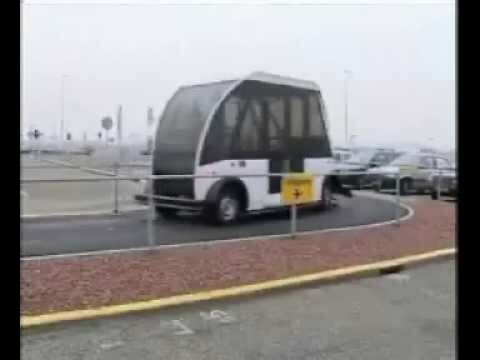 In 1997 four ParkShuttles were installed at Schiphol Airport’s long term parking lot P3, to improve the service to airline-passengers and to support Schiphol’s brand image. Each vehicles accommodated 8 seated passengers, 2 standees and luggage. At any time three ParkShuttles were in operation, while one vehicle is charged. When there are no transit requests, the vehicles space themselves to ensure minimal waiting times at each stop. When necessary the vehicle charging was made available by manual override for additional capacity. The track consisted of two loops of 1 kilometer each, featuring 3 stations per loop. The vehicles transported passengers from the shuttle stops near their cars to the main stop at the passenger lounge. At the passenger lounge berths were provided for alighting and boarding for both loop A and loop B. Each loop had several intersections with car traffic (equipped with barriers and traffic lights) and pedestrians (equipped with audible alarms only). From the passenger lounge buses provided transportation towards the passenger terminals. During the lifespan of the system several surveys showed great passenger satisfaction and the system proved very reliable. The service was available 24/7, free of charge. Operations were stopped in 2004 after 7 years of operation, where the pilot was intended for 3 years only initially. Installation of the 2nd generation ParkShuttle was seriously considered, but uncertainty in regard to future plans of Schiphol Airport and parking lot P3, as well as the development of air-traffic meant a positive decision could not be taken at that time.